1Curso de Fisioterapia do Centro Universitário Metodista-IPA, Porto Alegre, RS-Brasil. 2Programa de Pós Graduação em Biociências e Reabilitação do Centro Universitário Metodista-IPA, Porto Alegre, RS-Brasil. #Both authors contributed equally to this paper as first authors. Background: Emerging evidences have been pointed out that exercise in combination with dietary factors is able to affect molecular events related to synaptic plasticity and cognitive improvement. Therefore, this study sought to verify the impact of grape juice consumption and/or exercise in plasma neurotrophic factor (BDNF) levels and memory performance in elderly women. Methods: Nineteen healthy elderly women were randomly distributed in two groups: Grape Juice Group (GJG, n=9) and Grape Juice + Exercise Group (GJEG, n=10). The GJG was instructed to drunk daily the grape juice (400 ml) for 30 days, while the GJEG was also submitted to a physical exercise intervention (twice a week, 60 min/session). Memory function was assessed via the MoCA (Montreal Cognitive Assessment) and blood sampling was taken for BDNF analysis pre/post intervention in both groups. Results: It was observed a significant increase on BDNF levels in GJG (p=0.000) and GJEG (p=0.041) after intervention, while the memory improvement was verified only in GJEG (p=0.024). No differences between groups were found in the variables. Conclusion: In conclusion, the grape juice consumption per se is capable to modulates/increases BDNF levels, response that was not potentiated by exercise practice. On the other hand, the memory performance was improved only when grape juice consumption is combined to exercise intervention in healthy elderly women. Keywords: BDNF, cognition; elderly women, exercise, grape juice, memory. According to the World Health Organization (WHO), the current scenario is characterized by a progressive increase in the elderly population . This is a challenge that requires attention since the aging process is characterized by a remarkable decrease in cellular and molecular functions that can lead to body homeostasis imbalance which might be linked to the incidence of several diseases and cognitive decline . In this context, decreased levels of brain-derived neurotrophic factor (BDNF) have been pointed out as a pivotal hallmark widely linked to the aging-related cognitive impairment as well is a primary mechanism that contributes to neurodegeneration [3,4]. The BDNF is a member of the neurotrophin family of proteins that plays an important role in neuroplasticity [5,6], essential in promoting axonal guidance, synaptic plasticity, neuronal growth and development and is also involved with learning/memory processes [4,7]. Importantly, BDNF can cross the blood-brain barrier in a bidirectional manner, as well it was also reported that the peripheral levels of this neurotrophin seem to present a strong correlation with cerebrospinal fluid levels . Therefore, plasma BDNF levels have been used as a biomarker in several clinical studies [9-11]. In view of all these considerations, strategies that modulate peripheral levels of BDNF should be consider important tools among elderly. In this sense, Shephard and colleagues (1999) reported the importance of the regular practice of physical exercise against aging-associated health problems . In fact, some research groups have been highlighting BDNF upregulation in peripheral blood of elderly women in response to different exercise protocols [13,14]. Moreover, it was showed that increasing BDNF levels through exercise can positively affect brain function  and induce neurogenesis in hippocampus . Recently, Kim and colleagues (2018) showed that a single bout of exercise session can enhances BDNF levels and improves memory performance in middle-aged women . Similarly, it was also reported that chronic exercise interventions-induced BDNF increase and memory improvement in elderly . In addition to the regular physical exercise practice, some dietary components have been also believed to promote brain benefits in elderly. Specifically, it was reported that the oral administration of resveratrol enhanced BDNF levels in rat hippocampus, suggesting that the neuroprotective effects of this compound is related, at least in part, to increased levels of this neurotrophin . In addition, the consumption of grape juice, a very rich source of resveratrol, it was capable to reverse the course of neuronal and behavioural aging  and increase BDNF levels in frontal cortex of aged Wistar rats . In humans, the grape juice consumption demonstrated to improve memory and cognitive functions in older adults with early memory decline  and mild memory decline . Despite these findings, clinical studies regarding the impact of grape juice on BDNF modulation and the link between memory performance in elderly are scarce. Interestingly, emerging experimental and clinical findings have been providing evidence for improved physical endurance in response to resveratrol and grape juice consumption [22,23]. 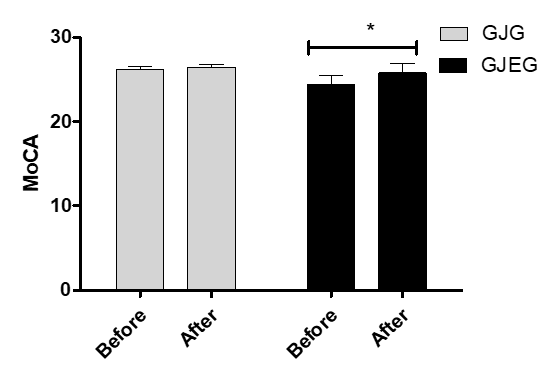 Specifically, it was demonstrated that aged mice that received resveratrol (15 mg/kg/day) in combination to 4 weeks of exercise training showed significant longer time to exhaustion when compared to the group that only was submitted to the exercise intervention . Furthermore, Toscano and colleagues (2015) also showed an ergogenic effect of grape juice consumption (10 mL/kg/min for 28 days) in young recreational runners by promoting increased time to exhaustion . Although, the molecular mechanisms related to these responses are not elucidated. Therefore, the current study aimed to investigate the effect of grape juice consumption and/or exercise in the modulation of BDNF levels and memory performance in healthy elderly women. This study was approved by The Research Ethics Committee of the Centro Universitário Metodista– IPA (2.533.844) and performed in accordance with the principles laid down in the Declaration of Helsinki. Written informed consent was obtained from all participants before enrolment in the study. Nineteen healthy elderly women were randomly (www.randomizer.org) distributed in two groups: Grape Juice Group (GJG, n=9) and Grape Juice + Exercise Group (GJEG, n=10). It was included in the study women over 59 years of age who were able to walk without using orthoses. The presence of neurological, cardiac and musculoskeletal diseases that made it impossible to carry out physical exercise, the inability of verbal communication with the investigators and the risk of deep vein thrombosis were considered exclusion criteria. The grape juice (Vitis labrusca L. variety Bordo) was kindly provided by Nova Aliança Winery, Flores da Cunha, RS, Brazil and was from the harvest of 2015 and all from the same lot. The juice was in tetrapack® packed in a 200mL presentation. Total phenolic content of the extract was measured by using the Folin–Ciocalteu colorimetric method, according to Singleton and colleagues (1999) . Phenolic content of the grape juice was expressedas mg of gallic acid equivalents (GAE) /L. Flavonoids were monitored by UV absorbance at 350 nm. All chromatographic procedures were performed at 25 °C. To quantify the main tannins, the extract was eluted at 1 mL/min (20 μL injection volume) using an isocratic mobile phase 90% acidic water (5% acetic acid) and 10% acidic methanol (5% acetic acid). The values were expressed in mg of quercetin equivalents (g EQ/L) . Identification and quantification of the major compounds in the beverages was performed by HPLCanalysis, using an HP 1100 system equipped with a UV/VIS detector (Santa Clara, CA, USA). Compound separation was performed with a 5 µm Li-Chrospher RP18 column (250 mm × 4 mm) at a flow rate of 1 mL/min. The beverages were filtered on a Millipore membrane (0.45 μm) and 20 μL injected into the device. Analysis of flavonoids was performed using a binary solvent system consisting of methanol (solvent A) and a water/acetic acid mixture (100/2) (solvent B) as the mobile phase unit. Gradient conditions were: 15% solvent A and 85% B (0–30 min), 40% solvent A and 60% B (30–40 min), 75% solvent A and 25% B (40–45 min), and 85% solvent A and 15% B (45–50 min). All the isolated polyphenols content was expressed in µg/mL of juice. Firstly, all participants were tested in the morning to avoid potential circadian variations. They were submitted to a physical examination, the evaluation of physical activity assessed by the International Physical Activity Questionnaire (IPAQ) and a rest blood sampling was taken from antecubital vein of the individuals (15 mL) for BDNF analysis. They were instructed to avoid strenuous physical exertion and alcohol or caffeine in a 24-hour period prior to the blood collection. Subsequently, the volunteers received all the required amount of juice for the thirty days, consuming 400ml of grape juice daily. The GJG only drunk the juice during this period, while the GJEG was submitted to a physical exercise intervention. E-mails, text messages, and phone calls were made in order to remind the participants about the consumption requirements. After 30 days, the participants were submitted to a new physical examination and blood collection while the first evaluation. Memory function was assessed via the MoCA (Montreal Cognitive Assessment) at baseline and post intervention in both groups. The GJEG was submitted to a concurrent exercise protocol, i.e. the combination of aerobic and resistance training, carried out in the gymnasium of the Centro Universitário Metodista – IPA. The intervention was done in group, for 30 days, twice a week, in the morning period (10:30 a.m. to 11:30 a.m.). Briefly, the meetings of the session were divided into three moments: Firstly, heating and stretching (10 min), followed by exercises of strengthening, balance, functional capacity, motor coordination, cognition (40 min). In these circuits were used exercises of dynamic and static balance and postural control in different positions and in different surfaces and planes. Weight transfers, trunk rotations, walking in a straight line and in circuits with tasks and associated tasks, and / or motor, resisted exercises for the upper sessions, squatting associated with the resistance motor task, among other variations. Finally, stretching and relaxation exercises were performed (10 min). Throughout the intervention, the progression of the exercises was applied through the acceptance of participants. Adherence/frequency to the intervention was measured by attendance in each session (adapted from Tanaka and colleagues, 2016) . Blood samples (approximately 15 ml) were taken in the antecubital vein of individuals before and after intervention. Histopaque® (Sigma-Aldrich 1077) was added into the collected sample in a 1:1 proportion in a conical tube and then centrifugation was held at 1500 rpm for 30 minutes at room temperature. Afterwards, the “buffer coat” was removed from the portion between plasma and Histopaque®. The plasma was collected and stored in conical tubes of 1.5 ml, at -80°C, for later determination of BDNF levels. Plasma BDNF levels were determined with the ELISA method, from Sigma-Aldrich commercial kit (catalog number RAB0026) according to the manufacturer’s instructions. Briefly, the sample and BDNF specific standards were added to ELISA microplate and incubated for 2.5 hours at room temperature. Subsequently, the solutions were discarded, and the same plate was washed 4 times with wash buffer (PBS, Tween 20 0.01%). After washing, the secondary antibody bound to biotin was added and incubated for 1 hour at room temperature with gentle agitation. The plate was again washed with wash buffer and streptavidin solution was added and the plate was incubated at room temperature for 45 minutes with gentle agitation. The solution was discarded, and the plate put through the washing process. Tetramethylbenzidine (TMB) was added, and then it was incubated for 30 minutes at room temperature, in light deprivation, with gentle agitation. The stop solution was added, and the plate was read in a spectrophotometer at a wavelength of 450nm. The plasma BDNF levels were expressed as ng/ml. The memory was evaluated by The Montreal Cognitive Assessment (MoCA), a screening tool developed to detect cognitive impairment by assessing various domains of cognition including attention, executive function, memory, language, visuospatial skills, conceptualization, calculation, and orientation. It is a simple 10-min paper-and-pencil test that takes only approximately 10 minutes to complete. The maximum MoCA score is 30 and total scores of less than 26 points may be indicative of cognitive impairment [27,28]. The International Physical Activity Questionnaire (IPAQ - short version) was used to assess the level of physical activity, addressing activities performed at work and at home, such as going from one place to another, leisure or sports, and activities at home such as caring of the garden, differentiating them in vigorous or moderate. The short form of evaluation is composed of four questions, each of these questions separated into "a" and "b", in which the individual must answer how many hours a day or per week performs the activity described. According Matsudo and colleagues (2001) the classification is made by 5 categories: 1) Very active: The subject must have performed vigorous activities for ≥ 5 days / wk and ≥ 30 minutes per session or ≥ 3 days / wk and ≥ 20 minutes per session plus moderate activities and / or walk for ≥ 5 days / wk ≥ 30 minutes per session. 2) Active: To be considered active, activities should add up to ≥ 150 minutes / day between walking, moderate and vigorous activity. 3) 3.1) Irregularly active A: In this category, the individual must have performed activities with a frequency of 5 days / week or with a sum of 150min / week. 3.2) Irregularly active B: This individual is classified because it did not reach the criteria of frequency and duration, but that carries out physical activity. 4) Sedentary: To be considered sedentary the individual did not perform more than 10min / without continuous physical activity . The differences in BNDF levels and MoCA score between groups and the moments (before and after) were performed by generalized estimating equation (GEE). The data were expressed as mean ± S.E.M and p < 0.05 indicates significant difference. All analyses were carried out using IBM SPSS 22.0. The total phenolic compounds observed in grape juice was 2.08 ± 0.019 g EAG/L, the flavonoids content was 0.258± 0.049g EAG/L. The majority polyphenols were: galic acid (4.92± 0.11 µg/mL), epigalocatechin (0.33 ± 0.005 µg/mL), epicatechin (3.08 ± 0.06 µg/mL), catechin (15.41± 0.59 µg/mL) and epigallocatechin gallate (4.13± 0.05 µg/mL). During the program, no participants withdrew, and mean attendance to the exercise sessions was highly consistent (~97%). The groups proved to be homogenous in all basal characteristics, as described in Table 1. There was no difference between groups. p> 0.05 according to generalized estimating equation (GEE). Data presented as mean ± standard deviation (numeric data) or relative frequency (categorical data). GJG=Grape Juice Group; GJEG=Grape Juice + Exercise Group. 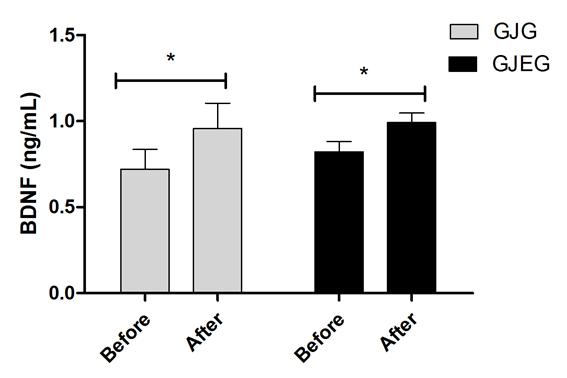 It was observed a significant increase on BDNF levels in both groups after intervention, as described in Figure 1 (GJG, p=0.00; GJEG, p=0.041). However, as highlighted in Figure 2, the memory improvement was verified only in GJEG (p=0.024). No differences between groups were found in BDNF analysis and memory performance. Figure 1. The impact of exercise and/or grape juice consumption on plasma BDNF levels of elderly women. *p<0.05 determined by Generalized Estimating Equations (GEEs). Figure 2. The impact of exercise and/or grape juice consumption on memory performance of elderly women. *p<0.05 determined by Generalized Estimating Equations (GEEs). It is widely known that a healthy diet and the regular exercise practice are linked with a reduced risk of cognitive decline and this response is related, at least in part, to BDNF upregulation . In view of these considerations, the current study sought to investigate the impact of grape juice consumption and/or exercise on BDNF modulation and memory performance in healthy elderly women. Interestingly, a significant BDNF enhancement after intervention was observed in GJG and GJEG women. These data could be partially related to experimental findings obtained by Dani and colleagues (2017) showing that 30 days of grape juice consumption was able to increase BDNF levels in frontal cortex and hippocampus from Wistar rats, suggesting that this period of consumption is enough to induce neuroplasticity . In this study the authors showed that the flavonols content (mainly epicatechin) could provoke a significant increase in BDNF levels. Analysing the phenolic content in our study, we observed that the total phenolic content is like observed in other studying with Brazilian grape juices . However, when we analyse de catechins levels, it was found that the catechin content is the majority, the values are higher than observed by Dani and colleagues (2017)  but lower than Toaldo and colleagues (2015) . Some studies are showing that the polyphenols could exerted an important effect in neurotrophin levels, promoting anxiolytic and antidepressive effect in different models [32,33]. Flavonoids, a large part of polyphenols obtained from plants, are speculated to be effective in the treatment of several CNS disorders such as depression [34,35]. Altogether, these data support the idea previously suggested that natural products rich in flavonoids, which increase the BDNF levels, are promising . To the best of our knowledge, this is the first clinical evidence demonstrating the impact of a combined intervention of exercise training and grape juice consumption on BDNF modulation. Although it was previously described in animal studies that exercise can potentially overcome the impact of the diet  as well could increase hippocampal BDNF levels in rats with diet induced cognitive decline , we did not observe differences between the evaluated groups in the present study. Van Praag et al. (2007) analysed the effect of 6 weeks of daily (−)-epicatechin consumption with or without running, in genes expression in hippocampal tissue. They observed that only the flavonol consumption, without running, increased the genes associated with learning, synaptic plasticity, and angiogenesis and the genes relevant to learning deficits and neurodegeneration were decreased. When they associated the (−)-epicatechin treatment with running they did not observe this modification . Taken together, these findings reinforce the neuroprotective effects of chronic grape juice consumption per se. It is important to note that the GJEG women were submitted to a 4-week exercise program intervention. Considering that it has been proposed that the magnitude of exercise effects on BDNF modulation possibly increases over time, with higher enhancements of this neurotrophin in response to larger volumes of training [39,40], we might suggest that the exposure time of our exercise protocol was insufficient to potentiate the effect of grape juice consumption on neuroplasticity in elderly women. Thus, it is recommended that future investigation with longer periods of physical exercise should be done in order to elucidate this issue. Several animal trials have been demonstrating the beneficial effects of daily supplementation with grape juice on brain function during the aging process, what is able to reverse the learning impairment and improve the cognitive performance [18,41]. Similarly, these responses have been also observed in humans. For instance, after 12 weeks of grape juice supplementation , a significant improvement on cognitive performance in healthy middle-aged individuals without effect on depressive symptoms was found. In accordance, healthy adult women also showed important improvements in immediate spatial memory following 12 weeks of daily grape juice consumption . Contrarily to these findings, in our study, the memory performance was not improved in the GJG. A possible factor that could justify this response is the protocol duration that we used. Our data could be related to those reported by Haskell-Ramsay who recently showed that the acute grape juice consumption did not influence the memory performance in healthy young adults . These findings led us to hypothesize that repeated/chronic consumption of grape juice is required to induce improvements in memory performance. Another aspect that should be considered is the age of participants cited in the studies. Although there is no evidence in the literature demonstrating the effects of age in response to grape juice consumption on memory and other clinical-functional outcomes, it has been reported in experimental findings that the consumption of polyphenols acts in an age-dependent manner in some biomarkers, which could affect some clinical data . Then, these results led us to infer that the age and time of grape juice consumption might be strictly related to its impact on memory performance. A remarkable point to discuss is that, different from GJG, a significant improvement in memory performance was found in GJEG. Our data can be partially related to those recently obtained by Dahlgren and co-workers (2018) who showed in a case study that a high intensity interval training during 12 weeks in combination to a ketogenic nutrition protocol during were able to improve the memory performance assessed by MoCA in a 57 year old female . The ketogenic diets, characterized to be high in fat and have low levels or no carbohydrate and low or normal levels of protein , seem to promote cell growth and regeneration in the brain and have been widely used for treating brain disorders including Parkinson's disease , Alzheimer's disease , amyotrophic lateral sclerosis  and brain ischemia . In this context, it is important to note that BDNF enhancement has been linked to the neuroprotective effects of ketogenic diet . Although it is impossible to establish at this moment the exact clinical relevance of our data, these findings may suggest that nutritional components that act as a powerful BDNF modulator, such as grape juice, may be considered important allies to improve memory abilities in elderly. Summarizing, our data presents a first attempt to bridge the gap between grape juice consumption and/or exercise-induced neuroplasticity and cognitive improvement in healthy elderly women. When combining this data, it appears entirely possible that the grape juice consumption per se is capable to increases BDNF levels, response that was not potentiated by exercise practice. On the other hand, the memory performance was only improved in the GJEG, suggesting that exercise practice in combination to grape juice consumption might be consider a non-invasive and effective strategy to improve this functional clinical outcome in healthy elderly women. The authors would like to thank, Governo do Estado do Rio Grande do Sul, IBRAVIN and Aliança Winery, Rio Grande do Sul, Brazil for the financial support in this work. World Health Organization, Active aging: a health politic, Brasilia: Pan American Health Organization, (2015). Houtkooper RH, Argmann C, Houten SM, Cantó C, Jeninga EH, Andreux PA, Thomas C, Doenlen R, Schoonjans K, Auwerx J. 2011. Sci Rep 1:134. doi: 10.1038/srep00134. Ventriglia M, Zanardini R, Bonomini C, Zanetti O, Volpe D, Pasqualetti P, Gennarelli M, Bocchio-Chiavetto L. 2013. Biomed Res Int. 901082. doi: 10.1155/2013/901082. Balaratnasingam S, Janca A. 2012. Brain derived neurotrophic factor: a novel neurotrophin involved in psychiatric and neurological disorders, Pharmacol Ther. 134(1):116-24. doi: 10.1016/j.pharmthera.2012.01.006. da Silveira FP, Basso C, Raupp W, Dalpiaz M, Bertoldi K, Siqueira IR, Lago PD, de Souza MP, Elsner VR. 2017. BDNF levels are increased in peripheral blood of middle-aged amateur runners with no changes on histone H4 acetylation levels. J Physiol Sci, 67(6): 681-687. doi: 10.1007/s12576-016-0496-6. Figueiredo AI, Jose Cunha J, Reichert Vital da Silva I, Luna Martins L, Bard A, et al. 2017. Running-induced Functional Mobility Improvement in the Elderly Males is Driven by Enhanced Plasma BDNF Levels and the Modulation of Global Histone H4 Acetylation Status. Middle East J Rehabil Health Stud. 4(3):e57486. doi: 10.5812/mejrh.57486. de Araujo CLP, da Silva IRV, Reinaldo GP, Peccin PK, Pochmann D, Teixeira PJZ, Elsner VR, Dal Lago P. 2018. Pulmonary rehabilitation and BDNF levels in patients with chronic obstructive pulmonary disease: a pilot study, Resp Physiol & Neurobiol. [Epub ahead of print]. doi: 10.1016/j.resp.2018.07.011. Shephard RJ, Balady GJ. 1999. Exercise as cardiovascular therapy. Circulation 99(7): 963–972. Kim JH, Kim DY. 2018. Aquarobic exercises improve the serum blood irisin and brain-derived neurotrophic factor levels in elderly women. Exp Gerontol. 104:60-65. doi: 10.1016/j.exger.2018.01.024. Lee SS, So YS. 2014. The effects of endurance exercise on and cognitive function, irisin and BDNF in elderly women. J. Korean Alliance Health Phys. Educ. Recreation Dance, 23(6): 417–427. Moreau D, Kirk IJ, Waldie KE. 2017. High-intensity training enhances executive function in children in a randomized, placebo-controlled trial. Elife. 22;6. pii: e25062. doi: 10.7554/eLife.25062. Rahvar M, Nikseresht M, Shafiee SM, Naghibalhossaini F, Rasti M, Panjehshahin MR, Owji AA. 2011. Effect of oral resveratrol on the BDNF gene expression in the hippocampus of the rat brain. Neuroch Res, 36(5): 761-765. doi: 10.1007/s11064-010-0396-8. Dani C, Andreazza AC, Gonçalves CA, Kapizinski F, Henriques JAP, Salvador M. 2017. Grape juice increases the BDNF levels but not alter the S100B levels in hippocampus and frontal cortex from male Wistar Rats. Anais da Academia Brasileira de Ciências, 89(1):155-161. doi: 10.1590/0001-3765201720160448. Krikorian R, Shidler MD, Nash TA, Kalt W, Vinqvist-Tymchuk MR, Shukitt-Hale B, Joseph JA. 2010. Blueberry supplementation improves memory in older adults. J Agric Food Chem, 58(7): 3996-4000. doi: 10.1021/jf9029332. Krikorian R, Boespflug EL, Fleck DE, Stein AL, Wightman JD, Shidler MD, Sadat-Hossieny S. 2012. Concord Grape Juice Supplementation and Neurocognitive Function in Human Aging. J Agric Food Chem, 60(23): 5736-5742. doi: 10.1021/jf300277g. Toscano LT, Tavares RL, Toscano LT, Silva CS, Almeida AE, Biasoto AC, Gonçalves Mda C, Silva AS. 2015. Potential ergogenic activity of grape juice in runners. Applied Physiol, Nutrition, and Metabol, 40(9): 899-906. doi: 10.1139/apnm-2015-0152. Muhammad MH, Allam MM. 2018. Resveratrol and/or exercise training counteract aging-associated decline of physical endurance in aged mice; targeting mitochondrial biogenesis and function. J Physiol Sci, 1-8. doi: 10.1007/s12576-017-0582-4. Singleton V et al. 1999. Analysis of total phenols and other oxidation substrates and antioxidants by means of folin-ciocalteu reagent, Methods in enzymology. Academic press, 299: 152-178. Moresco HH et al., 2014. Brighente, Myricitrin as the main constituent of two species of Myrcia. J App Pharm Sci, 4 (2): 001-007. Tanaka EG et al. 2016. The effect of supervised and home based exercises on balance in elderly subjects: a randomized controlled trial to prevent falls. Rev Bras Geriatria e Geront 19(3): 383-397. dx.doi.org/10.1590/1809-98232016019.150027. Julayanont P et al. 2015. The Montreal Cognitive Assessment—Basic: A Screening Tool for Mild Cognitive Impairment in Illiterate and Low Educated Elderly Adults. J. American Geriatrics Society, 63(12): 2550-2554. doi: 10.1111/jgs.13820. Lee JY et al. 2008. Brief screening for mild cognitive impairment in elderly outpatient clinic: validation of the Korean version of the Montreal Cognitive Assessment. J Geriatr Psychiatry Neurol, 21: 104–110. doi: 10.1177/0891988708316855. Matsudo SM, Araújo TL, Matsudo VKR, Andrade DR, Andrade EL, Oliveira LC, et al. 2001. Questionário Internacional de Atividade Física (IPAQ): estudo de validade e reprodutibilidade no Brasil. Rev Bras Ativ Saude 10:5-18. Nash DT. 2007. Nutritional and exercise aspects of cognitive impairment. J Clin Lipidol, (2007) 1:242–7.doi: 10.1016/j.jacl.2007.07.001. Toaldo IM et al. 2015. Bioactive potential of Vitis labrusca L. grape juices from the Southern Region of Brazil: phenolic and elemental composition and effect on lipid peroxidation in healthy subjects. Food Chem 173:527-535. doi: 10.1016/j.foodchem.2014.09.171. Stringer TP, Guerrieri D, Vivar C, van Praag H. 2015. Plant-derived flavanol (-) epicatechin mitigates anxiety in association with elevated hippocampal monoamine and BDNF levels, but does not influence pattern separation in mice. Transl Psychiatry 5(1): 1-9. doi: 10.1038/tp.2014.135. Lima EB et al. 2016. Antidepressant, antioxidant and neurotrophic properties of the standardized extract of Cocos nucifera husk fiber in mice. J Nat Med 70(3): 510-521. doi: 10.1007/s11418-016-0970-8. Donato F et al. 2014. Hesperidin exerts antidepressant like effects in acute and chronic treatments in mice: possible role of L-arginine-NO-cGMP pathway and BDNF levels. Brain Res Bull 104: 19-26. doi: 10.1016/j.brainresbull.2014.03.004. Souza LC, de Gomes MG, Goes AT, Del Fabbro L, Filho CB, Boeira SP, Jesse CR. 2013. Evidence for the involvement of the serotonergic 5-HT1A receptors in the antidepressant-like effect caused by hesperidin in mice, Prog Neuropsychopharmacol 40: 103-109. doi: 10.1016/j.pnpbp.2012.09.003. Noble EE, Mavanji V, Little MR, Billington CJ, Kotz CM, Wang C. 2014. Exercise reduces diet-induced cognitive decline and increases hippocampal brainderived neurotrophic factor in CA3 neurons, Neurobiol Learn Mem, 114:40–50. doi: 10.1016/j.nlm.2014.04.006. Szuhany KL, Bugatti M, Otto MW. 2015. A meta-analytic review of the effects of exercise on brain-derived neurotrophic factor. Psychiatr. Res, 60: 56–64. doi: 10.1016/j.jpsychires.2014.10.003. de Assis GG, de Almondes KM. 2017. Exercise-dependent BDNF as a Modulatory Factor for the Executive Processing of Individuals in Course of Cognitive Decline, A Systematic Review. Front Psychol, 8:584. doi: 10.3389/fpsyg.2017.00584. Smith JM, Stouffer EM. 2014. Concondant grape juice reverses the age-related impairment in latent learning in rats. Nutr Neurosci. (2):81-7. doi: 10.1179/1476830513Y.0000000064. Lamport DJ et al. 2016. Concord grape juice, cognitive function, and driving performance: a 12-week, placebo-controlled, randomized crossover trial in mothers of preteen children. Am J Clin Nutr. 103(3):775-83. doi: 10.3945/ajcn.115.114553. Haskell-Ramsay CF, Stuart RC, Okello EJ, Watson AW. 2017. Cognitive and mood improvements following acute supplementation with purple grape juice in healthy young adults. Eur J Nutr 56(8): 2621-2631. doi: 10.1007/s00394-017-1454-7. Zagayko AL, Kravchenko GB, Krasilnikova OA, Ogai YO. 2013. Grape polyphenols increase the activity of HDL enzymes in old and obese rats, Oxid Med Cell Longevity. 593761. doi: 10.1155/2013/593761. Dahlgren K, Gibas KJ. 2018. Ketogenic diet, high intensity interval training (HIIT) and memory training in the treatment of mild cognitive impairment: A case study. Diabetes Metab Syndr. 12(5):819-822. doi: 10.1016/j.dsx.2018.04.031. Yao J, Chen S, Mao Z, Cadenas E, Brinton RD. 2011. 2-Deoxy-D-glucose treatment induces ketogenesis, sustains mitochondrial function, and reduces pathology in female mouse model of Alzheimer's disease. PLoS One 6(7):e21788. doi: 10.1371/journal.pone.0021788.